November 30, 2015 - by benign0 - 21 Comments. Former Akbayan House Representative Walden Bello was, of course, right when he said that “The burden of proof, in short, is on us to prove Duterte wrong.” He was referring to those who take issue with former Davao City mayor and now presidential candidate Rodrigo Duterte’s defiant stand if he is elected president to continue the tradition he started in his city of combatting rampant criminality even if it involves means outside the framework of the law. Whilst many Filipinos may think Duterte’s alleged track record of vigilantism which he has baldly planned to continue into his presidency is an affront to human rights, the Philippines, to be fair, has so far failed to live up to those ideals. And this is why Duterte’s rhetoric resonates powerfully with Filipino voters today. He has successfully tapped into the collective frustration — and impatience — that has been welling up in Filipinos over the last several decades since 1986. Following the “people power revolution” in that year, Filipinos were repeatedly promised a new, better, and just Philippines. That promise has repeatedly been broken since. And the straw that finally broke the proverbial camel’s back was, in all ironies, laid by none other than President Benigno Simeon ‘BS’ Aquino III whose administration was a virtual antithesis of everything his mother promised Filipinos when she ascended power in 1986. Under Aquino’s watch, a former president was arbitrarily imprisoned, a Chief Justice was impeached by a kangaroo court, plantation workers were massacred, a vast pork barrel scandal was uncovered but not dealt with decisively, and the national government conspired with a belligerent foreign government to carve out a chunk of Mindanao to be handed over to an Islamic terrorist group. Still surprised that Filipinos have seriously considered a man like Duterte for the presidency? The reason these alleged human rights violations critics have been lobbing at Duterte seem to simply bounce off him is that nobody in the Philippines possesses the moral ascendancy to pontificate about “human rights”. Indeed, Bello points out that the trouble with Filipinos is that we have for so long “complacently assumed there is a national consensus on” human rights and due process. Unfortunately, the rhetoric has so far not been matched by real results. It is that prolonged mismatched between the talk and the walk that has paved the way for the rise of Duterte. 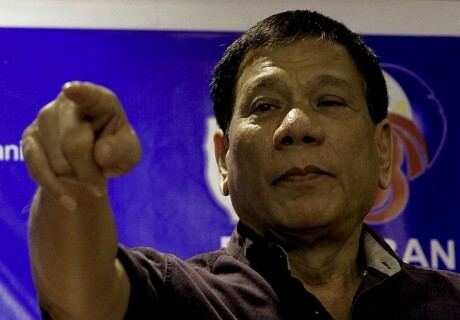 [Duterte’s running for president] will also challenge us to prove to the people that the rule of law is not empty rhetoric; that our laws can, in fact, be used to prosecute and punish the criminals and the corrupt; and that the pursuit of law and justice is blind, meaning it is not perverted by double standards. Well, that has never been more relevant than it is today. The two elephants in the room — the Maguindanao massacre that remains unresolved and the vast multi-billion-peso pork barrel scam that has been swept under the rug — are staring us in the face as if telling us, “here is your challenge Filipinos; right here, right now”. If we truly detest the prospect of a Duterte presidency on grounds that he will, as president, disrespect “due process”, then the opportunity to prove that due process does yield results in the Philippines is right there in front of us. The fact that Duterte, today, commands a strong following is testament to the sad reality that Filipinos have so many times balked at stepping up to that challenge. Filipinos deserve a Duterte presidency. Next Article Buying and selling cars in the Philippines has never been easier! I must say article is a very good take. I have my own reservations about DU30, but I am beginning to think his entry into the race elevates the debates of 2016 into more substantial topics. Indeed, he is already a slap in the face of Daang Matuwid, directly, and indirectly, against EDSA1 for he represents a strong-man rule, even if it is of a different shade. But, we are not yet sure if Comelec will accept his candidacy for it is supposed to replace Diño, who has already been declared a nuisance candidate. Hope Comelec accepts his application otherwise they will just give credence to the report that he is just being used by LP to attack the front runner, Grace Poe. Again, either way, it reflects that LP is in a quandary. If they have something to do with this candidacy, then it is underestimating a potential candidate that has turned out to be the most formidable. It is the same stupid move in inviting Poe to be their VP, but now attacking her citizenship and lying that they didn’t know about her citizenship. If they have nothing to do with it, then they have really been very complacent for up to now Mar Roxas talks nonsense Because of that, they simply look like they are paving a smooth road for DU30’s victory. Maybe LP believes that they could hocus PCOS. But if Mar is way way down in surveys hocus PCOS won’t help them for they will just invite people power as a result. It would be an irony of the first order if that happens. Win or lose, it is good to see DU30 in the race. He is already a good vehicle to open up discussions re the deficiencies of the yellow era. Actually, just heard his speech. What is good about him is that he not only discusses his strenght, but his weaknesses. That is already an anti-thesis to what has been in the last five years, and is a sign of a good leader, maybe also of a good team player. But, let me still keep my reservation about him for now. That’s Duterte. He embraces both good and bad publicity and grows stronger as more controversy surrounds him. He is the antithesis of the pretentious ‘pagmamalinis’ style of traditional politicians in that he wears all his warts in public for all to see. Not to mention, Digong’s “skin in the game” is what separates him from the rest. He is willing to risk everything if he can’t deliver. Remember the Hammurabi’s code for builders? If the house the builder builds collapses and causes the death of the owner; the builder shall be put to death. Given his track record, that is a huge risk he’s making for the benefit of the collective. That is pure SITG and antifragility. agreed. Digong appeared because of the government’s incompetence. just like Neo and Mr. Smith in the matrix. if there’s a negative in the equation, then there is positive. the formula is now complete. there’s a news that Duterte cussed out Pope Francis in one of his jokes. i’m a catholic and though it may hurt some of my fellow Catholics to me, it’s just fine. a friend of mine even made fun of the pope in the office and he’s catholic too. ano i-react ko, “ay ayaw ko na si duterte, kasi minura niya si pope.” if catholics react this way, then i call it kababawan. Indeed, the filipino people are Mad for Change. I just noticed the impact of that news in social media just now. The contradictions can’t get any better. Catholicism in the Philippines are now becoming more perversive than before. So this is the reason why where too far behind from other Asian countries like Japan, South Korea, Singapore, Taiwan, etc. Let us just wait and see. If vigilante justice will come. It will replace the “Selective Justice” of Aquino and De Lima and her driver/love. Maybe we can use vigilante system of Justice on: Aquino, De Lima, Mar Roxas, Binay…and all the corrupt people in our political sytem. Quite my idea too. Filipinos who hate fellow Filipinos will turn a blind eye to death squads working in the shadows. The question is, once a relative – who they know to be innocent – falls to the death squads, I wonder if the death squad yahoo will change their opinion. that’s a short-term solution and i believed Duterte, as a lawyer, will not fall for it. he would want a long term and equitable solution. and besides, how would one know if it’s really the vigilante death squad that bumped someone’s next of kin or a friend? it will sound like the salem’s witch hunt. no, it will not work. I bet Mr. Duterte doesn’t have the balls to declare something similar of that nature against the Muslim Community! I wonder why Fans of Duterte, just in defense of their idol, are willing to go against the norm of social conduct?! FYI, his wife a Moro blood a Maranao if I’m not mistaken. His son is married to a Tausug princess. Go figure. it’s rather say,…not because they like Duterte, but what they truly like is a strict leader who can lead with iron fists. bec they see marcos in him. people are tired of this yellow propaganda everyday. I deserve better than Duterte. Vigilante hero figures like batman and the mutant ninja turtles only surface when the government/police/judiciary is too weak, corrupt and incompetent. The need for justice is like that for air/water. Ask the families of fallen SAF44 if they’ll be voting biz-as-usual mis-encountering Mar Roxas, or Grace Poe, who gave a cute little investigative report. I can almost guarantee that they have someone else in mind. If our very own police don’t have confidence in what they stand for – that’s your answer. You get what you deserve. Imagine the Phil to be a helicopter flying on 4 rotor blades: executive, legislative, judiciary, and the constitution. If the judiciary is broken, do you know what the masses will install to keep the aircraft stable in mid-air: yup vigilantes. The alternative is worse: watch Black Hawk Down for a picture of what I mean. The irony of the process of thought control: the more energy you put into trying to control your ideas and what you think about, the more your ideas end up controlling you.